Cast resin makes a very beautiful poker chip, and very unusual, although considerably more expensive than the molded chips on the market. Making them requires a rigid circular-saw and guide set-up, a free-cutting blade and close attention, as the least variation in this thin thickness will show up. The blade must be set so that it clears the side of its "well" by only about 1/16", as otherwise the thin cut-off chip will be dragged into the gap and jam the blade. The blade itself must be in perfect condition and fast cutting, as a dull or poor blade working in solid rod this thick will bind and heat. The type of guide having a clamp for holding the material is preferable, as this insures a rigid set-up and a square cut, but in any event a good guide must be used and the material firmly held. A stop is clamped to the table so that the rod can be moved in (1/8" past the blade) after each cut, insuring uniform thickness of the chips. If after making a trial cut, you find the chip is badly scored, burned, or that you have a rough cut, get another blade or abandon the project, as this would necessitate too much labor in sanding, with the possibility of sanding the chips too thin or unevenly. Rods of this diameter are 21 inches long, which allows material enough for 100 chips, in one color per rod, allowing 1/8" for the chips and 1/16" for the saw-cut. Ideal equipment would be an abrasive cut-off wheel under a stream of water described in a previous chapter or a "slicer". The circular saw is the second choice, while a band-saw could not be depended upon to make a true enough cut. Sand lightly on a belt, and the buffing-wheel will take enough off the corners to give them a pleasant feel. Ideal finishing apparatus for chips is a tumbling-barrel, but the job can be done on a buffing-wheel by hand. Material: #6 cyl; 3/16" sheet. 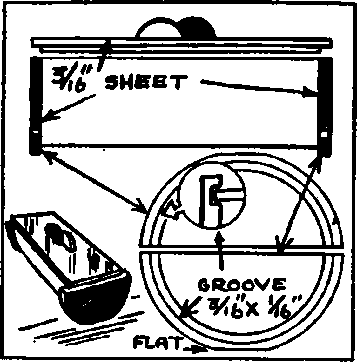 Figure 56 illustrates one of the simplest pieces of lathe-work in the box line, the end-pieces being the only lathe-turned portion. These consist of a 3 1/4" diameter disc, with a groove turned in its face into which the end of the half-cylinder is fitted. After turning, the sheet is sawed in half, one half for each end. After the cylinder has been sawed in half longitudinally and polished all over except for the end surfaces, the end-pieces are cemented on, and when dry, the box is rubbed on a sheet of sandpaper laying on a flat surface, sanding a slight "flat" on the bottom of the curve in the end-pieces. The top is a piece of 3/16" sheet to fit, with a rabbett around the edge setting down into the box. The same effect could be produced with less work by cementing a short strip on the under side of the lid, across each end. The cylinder and ends should be contrasting colors, and the handle is made from two small half-circles, one of each color, cemented together vertically to the top. A #6 cylinder is 6 1/4" long, which would permit of inserting a partition in the middle cross-wise, so that cigarettes of two different brands could be kept in either end. There are of course many variations possible in the footings, handle and ornamentation of this type of box. Fig. 56. The covered tray in Project 43. A groove is toned in the circular piece which is cut in two to form the two ends, and the ends of the cylinder are cemented into this groove.